Bridlington Sports Club’s manager Gary Simm has left the club after just half-a-season at the helm. 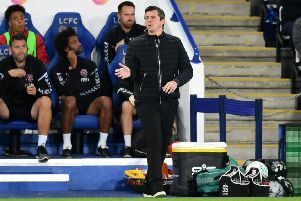 He took over in January, and helped to steer the team away from the Humber Premier League relegation zone, alongside joint boss Sean Chapman, who has also left. The Dukes Park club are now looking for a new manager, but Simm feels his successor has a good platform to work from. He told the Free Press: “They have a squad there which is capable of challenging for the top four, at least. “Bridlington is a big place, they should be able to pull together a squad of very capable players. “It was a brilliant challenge for me and I have loved doing it. Simm informed the club of his decision to step down last night, and said work and family commitments had been the major factors. “I haven’t got the time. If you can’t give it 100%, then it is not worth trying to do it,” the former Scarborough Athletic Reserves boss said. He took over at the turn of the year when relegation looked a real threat, but Sports Club eventually finished in 12th spot, comfortably clear of the teams in the drop zone. They were only denied a place in the League Cup final by a last-minute goal by champions Wawne United.